There is no doubting the fact that the Internet and related technology has truly made a substantial impact on our modern world. What's even more astounding is that this monumental change has been focused in the last 10-15 years. In that time, smartphones and tablet technology is ubiquitous and a substantial portion of the world has access to the World Wide Web. In this article we will discuss the Positive Impact of Internet of Things (IoT) on Retail Business with the help of a detailed Infographic. Having access to this interconnected world that we refer to as the online community or the Internet has had a knock on impacts on our everyday lives, how we commute, how we socialize, how we work and of course how we shop. Through the Internet, we have seen the development of a whole new niche, that being the E-commerce sector. With that, of course, has also come challenges; it is easy to set up an eCommerce business but with so much online technology and competition plus incidental issues like logistics and warehousing, it isn’t quick-fix business for just anyone. That is also not to say that the Internet hasn't brought challenges to brick and mortar retailers. Of course today we are witnessing many store closures all over the world. However for store owners to think that the Internet and its related technologies are bringing about its death would be ill informed. While of course, the Internet has brought huge challenges in the form of online competition, the Internet can also deliver competitive advantages to brick and mortar retailers should they know how to use it correctly. The key is to make oneself informed on what is possible and what exactly can help your business. The Internet and its related technologies aren't simply going away and it would be simply ignorant and dangerous of a retailer to think like that. These new advances represent huge opportunities for those retailers who are willing to fight and learn how to incorporate them into their business and drive it forward. 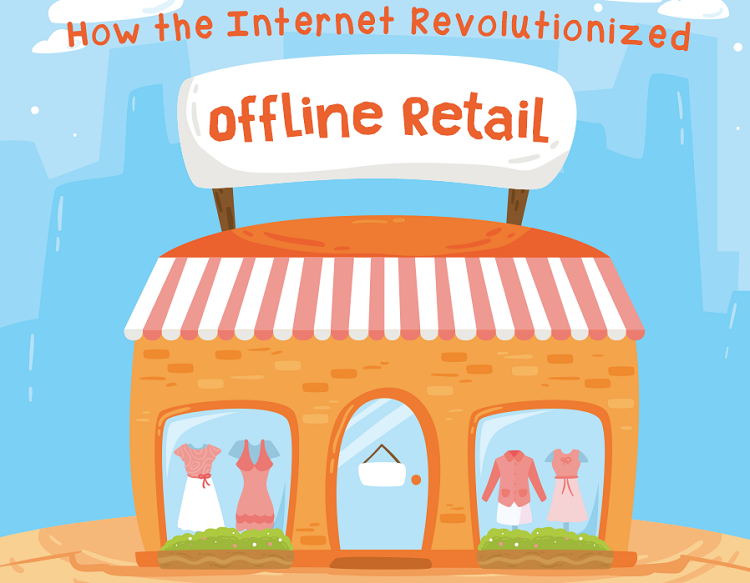 The people over at Store Traffic have created an infographic below which covers some very interesting aspects to the topic of how the Internet and technology have influenced and advanced the retail niche. In the infographic you'll read about some relevant statistics related to the topic; it explains how to develop an online presence even for the most basic; it covers how to utilize social media in your goals; it examines the whole area of Internet of Things (IoT) and Retail. Read on to discover more.